Mountain gorillas are among the rarest animal species, with fewer than 900 left in the whole world! Gorilla Safaris Adventure is here to share with you some interesting facts about mountain gorillas. 1. Gorillas share human DNA. Gorillas are special primates sharing over 98% of their DNA with humans. 2. Mountain gorillas live only in Africa and are distributed into two populations. One gorilla population is found in the Virunga volcanic mountains of East Africa within three national parks: Mgahinga, in south-west Uganda, Volcanoes in north-west Rwanda and Virunga in the eastern Democratic Republic of Congo (DRC). The other is found in Uganda’s Bwindi Impenetrable National Park. 3. Some primatologists consider the Bwindi gorilla population in Uganda as a separate subspecies. However, there is no description that has been concluded to ascertain this. 4. Mountain gorillas are as shy as they are strong. 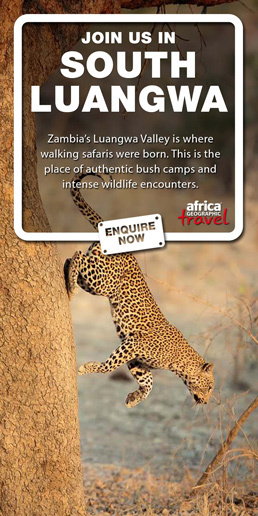 Locals living near Bwindi Impenetrable National Park know this for a fact! A mountain gorilla will never chase you when you are facing it and looking directly into its eyes. However, you should know that when threatened they can be aggressive. They beat their chests and let out angry grunts and roars. Group leaders will charge at the threat and mothers will fight to the death to protect their young. 5. 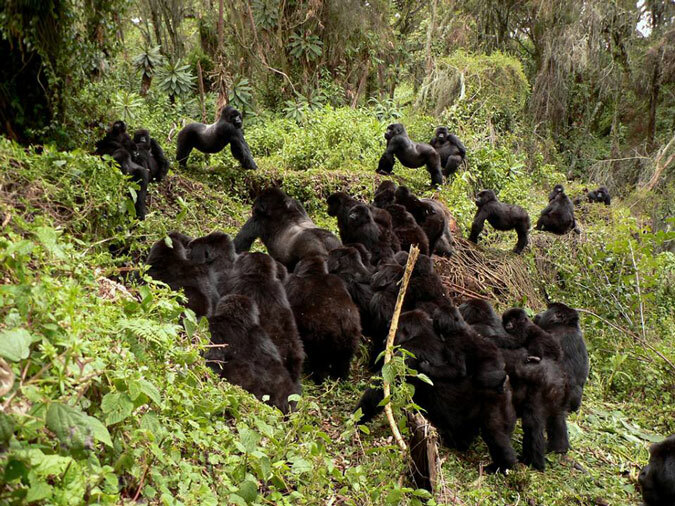 Mountain gorillas live in groups of up to 30. The largest gorilla group or family ever studied is in Rwanda and is led by Cantsbee (now 38 years old! 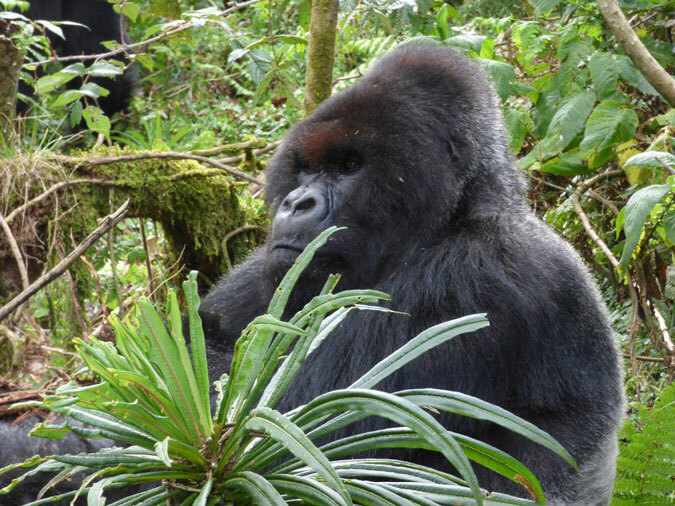 ), who is the oldest known mountain gorilla in the whole world. A gorilla family is led by a silverback. These troops also include several younger males, adult and juvenile females, and infants. 6. Aged male gorillas are called silverbacks. This name originates from the silver stripe they develop on their backs when they mature. The silver hair can be compared to the grey hair that humans develop. 7. 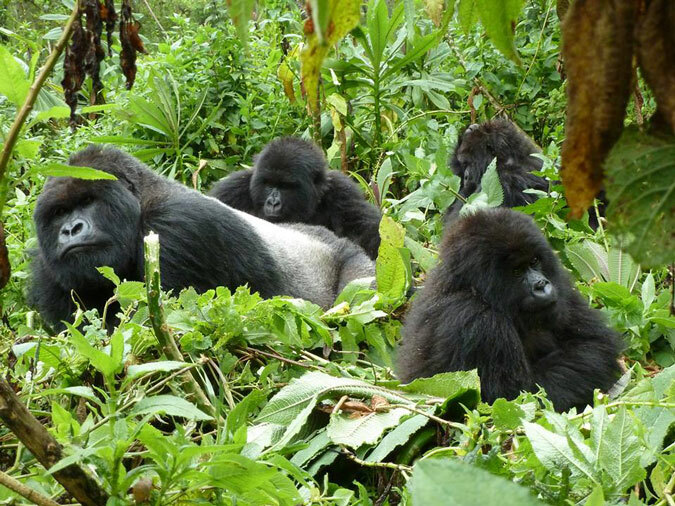 The silverback gorillas ensure protection of the group. 8. Female mountain gorillas can start reproducing from the age of ten. They carry one or two babies at a time and give birth after an eight and a half-month gestation period. In general, they will bear between two and six offspring in a lifetime. 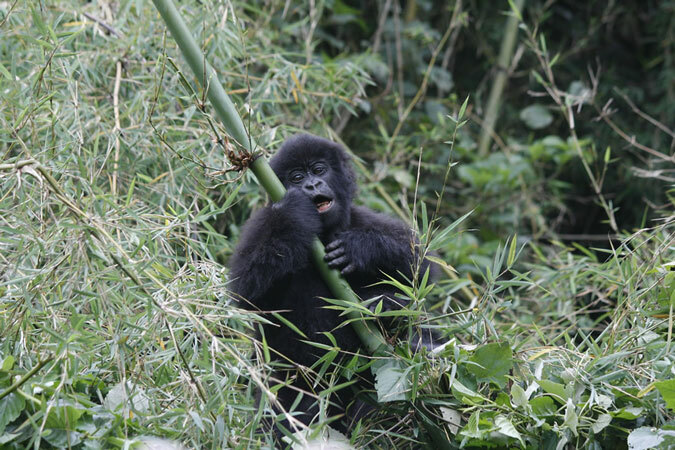 Would you like to see the mountain gorillas in the wild? Why not book a gorilla safari and meet these endangered giants in the wild of Uganda, Rwanda and the Democratic Republic of Congo. 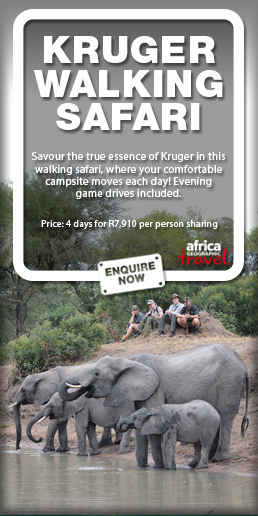 Gorilla safaris are done all year round and our trips can depart anytime.